Did someone order a time machine back to 2009? It seems almost impossible (especially after the 2013 Suzy Menkes versus Susie Bubble showdown), but here we are, discussing the validity of street style stars and bloggers in The Year of our Lord 2016. As has now made the Internet rounds, Vogue.com published a Milan fashion week wrap-up on Sunday, which quickly devolved from a discussion about the clothes into a takedown of bloggers. At various turns, bloggers were accused of being "embarrassing," "sad," or "pathetic" — is it any wonder that many took offense? In the interest of full disclosure, I briefly worked for Vogue Runway last year, and all of the women who wrote the piece are women whose work I greatly admire. They&apos;re all sharp, highly-observant, culturally aware and regularly push the boundaries of what both fashion and fashion criticism can achieve — which is what made the piece especially surprising. It&apos;s certainly true that street style has become less about having genuine style and more about piling on the most eye-catching, in-season pieces (some of which is paid product placement from brands, something akin to editors including clothing and accessories in magazine shoots to please their advertisers). We are all guilty of mocking the "season pushers," the women wearing fur in September and sandals in February to show off their newest goods; that is still very ridiculous, and editors are just as guilty of this practice. 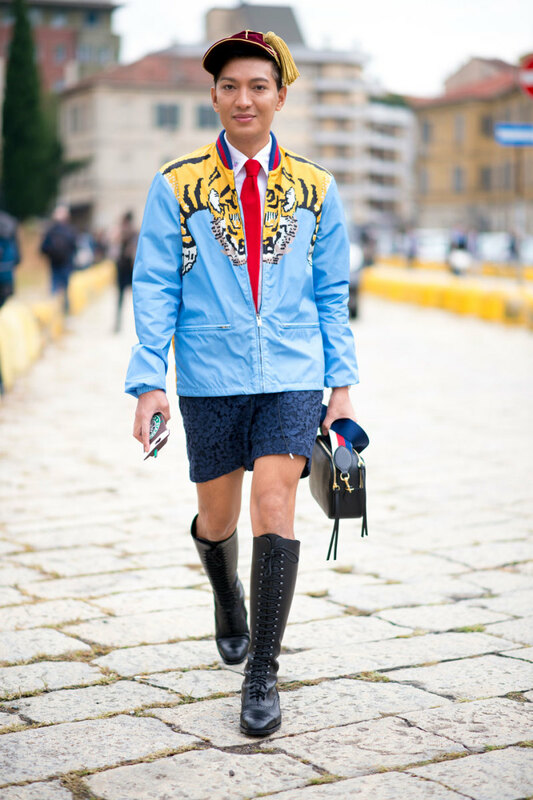 But bloggers, the "death of style"? I&apos;ve long been tired of seeing the same handful of editors and industry insiders (all thin, it must be said) in slide after slide, season after season in street style galleries; the idea of the "model off duty" (skinny jeans, leather jackets, fresh-from-the-runway beauty, a gifted "It" bag) became a cliché long ago. As insiders like Anna Dello Russo upped the ante with their peacocking (which included multiple outfit changes per day) and more and more websites wanted a piece of the surefire street style traffic, the death of style — in this sense, at least — happened years ago. And yet: The bloggers get photographed, and they get placed in those same slideshows. If you&apos;re tired of watching them commit "the desperate troll up and down outside shows," maybe just stop rewarding them. Of course, this train has already left the station. Do I feel incredibly annoyed when I show up to my fourth row seat at a show like, say, Jeremy Scott, only to see a front row filled with people I don&apos;t even recognize, but wearing head-to-toe looks of the designer&apos;s creation? Absolutely. Like many of my colleagues, I went to school to become a professional writer, logged hours interning, and continue to work really hard for my seat at a show. It can often feel like these women got theirs by being clever with an Instagram filter, attaching themselves to similarly stylish friends (sometimes literally) and not feeling any sense of shame when cameras are present — the latter being a skill I would like to learn, honestly. But designers like Jeremy Scott — or, more accurately, the PR handling the seating at the shows — don&apos;t care about my master&apos;s degree or the years I&apos;ve spent studying the inner workings of their brands, they care about selling clothes; and those bloggers, those influencers (which are two different things — a topic for a different day), move product. There&apos;s absolutely no denying this in a world where women like Chiara Ferragni are making millions of dollars each year and scoring major contracts (and, yes, international Vogue covers). This isn&apos;t something they could have achieved without some business sense, and let&apos;s be clear: These women are unquestionably running businesses. This is a good thing! This means that fashion has democratized itself, and that people don&apos;t need dictates on what is good and what is bad coming down from some source on high. Let&apos;s be real: Consumers aren&apos;t waiting to see what WWD tells them to wear next season. There will always be a place for fashion writers and critics to contextualize the collections, to find and help cultivate new talent, and to give the industry a voice. That place just may no longer be on the front rows of fashion month, where the premium is placed on those ever-important Insta-bait moments. After all, customers who want to buy Tommy Hilfiger&apos;s collaboration with Gigi Hadid aren&apos;t waiting to hear Tim Blanks&apos;s final word — they&apos;re waiting to see how girls like Danielle Bernstein or Arielle Charnas style the clothes on their social media feeds. Perhaps I feel more willing to give these bloggers leeway because, like them, I came up in the industry through the digital route. I am often seated near them at dinners, behind them at shows, and invited to interview them for product launches. Those who work at Vogue.com are fashion writers; I&apos;m often called a "blogger," despite the fact that I view my own job as being more similar to those at a publishing house than I do the street style stars who happen to run a blog or a popular Instagram account. But despite how it may sometimes feel, these people are not threats to my job; they&apos;re just another, albeit newer, part of the fashion ecosystem, one that is helping it move forward — for better or worse.